The vast majority of material used in exhibitions in the Heritage Centre comes from the Town Archives. It is thanks to a former parish clerk called Harry Proudfoot that the archives exist. During his term in office he collected and preserved all papers and documents relating to the parish. 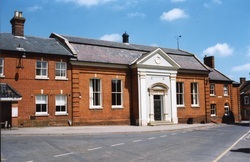 The town council have preserved this collection and it is still being added to today. The current Archivist is Lloyd Mills, who with a team of volunteers, continues to catalogue and maintain the ever growing collection. Lloyd continues the work of previous Archivists - Derek Lyons, Tom Mollard, and Ron Peabody -who all built on the work of Dr. John Sapwell who seems to have been the first to organise and catalogue the materials. The full catalogue of the archive material is available to view in the heritage centre, as is the full photographic archive. The originals of all the materials in the centre can be viewed in the town archive which is open every Wednesday morning. Please ask for further information. The Archives also includes the work that Carole Matthews has been overseeing with the COMMA (Community Mulit-Media Archive) project. The system can accept video and audio reminiscences and we are always keen to talk to people about their experiences of living in the town. Visit the Town Council Website for contact details.